Nestled along a backstreet behind the courthouse in downtown Majuro, capital of the Marshall Islands, is a mosque that looks like any other mosque in the world. A cinder block building, covered with a gabled roof that supports two minarets, its paint combining the cerulean blue of the lagoon and the white of the ocean waves. The Arabic inscription on the entrance proclaims the unity of God and the prophethood of Mohammed. A speaker sounds the call to prayer five times a day. Pakistan in the same shape, it would have run the risk of being attacked and vandalised by religious extremists, or padlocked by the government for violating the ‘copyright’ to practice the world’s second-largest religion. The mosque belongs to the Ahmadiyya Muslim community, an Islamic revivalist movement that has its origins in 19th century South Asia. The community considers its founder, Mirza Ghulam Ahmad, to be the promised messiah and a spiritual successor of the Prophet of Islam, challenging the majority belief in the finality of Mohammed’s prophethood. Following the creation of Pakistan in 1947, the community moved its headquarters to Rabwah, a city in the province of Punjab. Religious extremists soon began attacking them, and in 1974, after decades of riots, Pakistan declared Ahmadis non-Muslim. Ten years later, it snatched from them the right to practice the religion, or ‘present’ themselves as Muslims by doing Muslim things – the only law of its kind in the world. They cannot say the Islamic greeting, cannot make their places of worship look like mosques. A violation can lead to a fine and a maximum of three years behind bars. Since then, Ahmadis have been subjected to routine violence and discrimination in the country. In the summer of 2010, an Ahmadi mosque in the Pakistani city of Lahore was attacked. Nearly 100 were massacred and another 120 were injured. In a report submitted to the United Nations Human Rights Council just last month, the UN Special Rapporteur on freedom of religion Ahmed Shaheed lambasted Pakistan for what he called “systematic persecution” of the Ahmadis by means of “state-sanctioned discrimination.” Pakistan said Shaheed’s findings were “grossly exaggerated”. According to the community, last year four of their mosques in Pakistan were sealed, another two were set ablaze and two more were torn down. Two Ahmadis were murdered and another nine survived attacks, while 62 were booked and 15 were arrested on faith-based charges. Thankfully though, inside the tiny island-nation some 4,600 miles away in the Pacific Ocean, Ahmadi Muslims have the right to have rights. 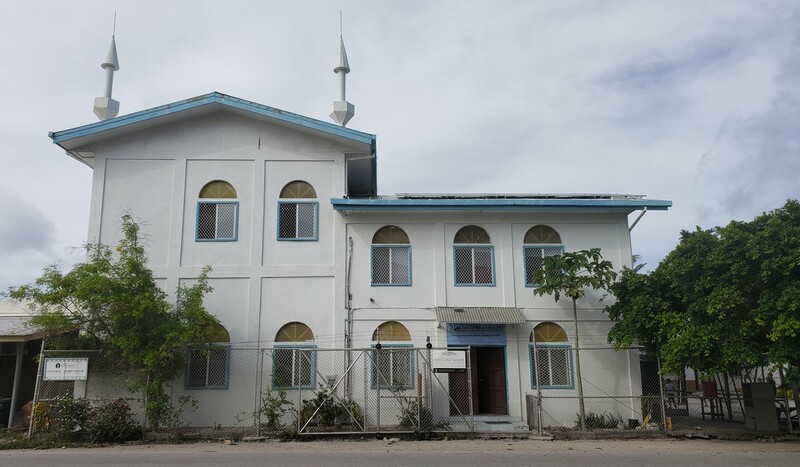 “Ahmadis of the Marshall Islands are aware of their privilege to practice their religion freely,” says Sajid Iqbal, the Majuro mosque’s prayer leader. Efforts by the community to undo the resentment tell their own story of persecution and show from their actions a different side of Islamy. Humanity First, the movement’s charity arm, began working in the country in February 2011, providing health care, remedial education for children and feeding the needy. It helped dispel misconceptions and the Marshallese gradually began to embrace Ahmadis as fellow citizens. James Matayoshi, mayor of Rongelap atoll, has been among those politicians who threw weight behind the Ahmadis. “Christians here have been a little biased towards them,” he says. In Pakistan, the common people are forced by the state to participate in the discrimination. To obtain an ID, every citizen has to declare that they consider Ahmad an impostor and his followers outside the fold of Islam. As for the leaders, they tread a thin line when it comes to the community. Voicing support is out of the question. Mostly, they have to think twice before even expressing concern over Ahmadi persecution. Last summer, the populist politico Imran Khan became prime minister with the promise of change. His government formed a council of experts to advise it on curing the country’s ailing economy. Among the 18 specialists was Atif Mian, a prominent Princeton economist and a devout Ahmadi. Religious extremists threatened to agitate against the appointment and the government cowered. It asked Mian to step down and vociferously denied having a soft corner for the community. Global condemnation followed. Nearly 300 economists, including eight Nobel Prize winners, put out a statement in Mian’s support. Khan later admitted that this wasn’t the hill he was willing to die on. Iqbal, 28, is a bespectacled young man with a cropped beard and a gentle demeanour. He was born and raised in Toronto, Canada, where his parents had migrated from Pakistan to flee persecution. He trained in Islamic theology at the community seminary for seven years and arrived in the Marshall Islands in 2017 to head the mosque. Every day, Iqbal and his wife Maria wake up at around 5am to prepare for the morning prayer congregation, attended by both men and women in their respective halls. Iqbal’s quarters are on the second floor. On the ground floor is the library and a community kitchen, where three meals are served daily and everyone is invited. Breakfast is usually attended by the local schoolchildren. For lunch and dinner, food is prepared for up to 80 people. Marshallese delicacies made with local fresh catch, coconut and rice are popular. The community has started a garden nearby to supply vegetables to the kitchen. It has recently been planted with spinach, tomatoes, cabbage, okra and pumpkin. The Marshallese, themselves victims of centuries of colonisation and radiation from American nuclear testing, understand what victimhood feels like and are willing to give space to the religious group. But the fears are still there. “For us, it is still a little difficult. They are scared of us sometimes,” says Iqbal. A threatening message on Facebook may arrive every now and then but the vandalism has stopped. Iqbal has been looking to hire the services of a translator. A friend referred someone who agreed to help out but wouldn’t come to the mosque. He doesn’t want to be seen as being associated with the Muslims. The enemies of Ahmadiyyat are helping a lot in the spread of Ahmadiyyat (by forcing Ahmais to leave Pakistan). Sir, the source given at the end of the article is not related to the article itself. Please give the actual source. Sorry … My mistake. And thanks for the help!